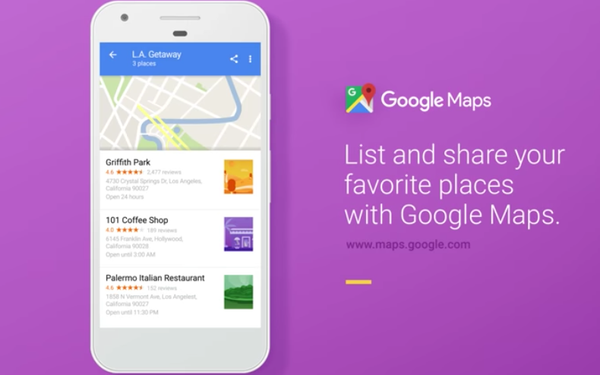 A Google Maps feature released Monday that lets users dog-ear or save places they want to visit in the future could give marketers another signal in which to reach consumers through video and social content or search and display ads. Users create their lists of favorite locations such as Best Views in San Diego, and can share them with friends through text messages and messaging apps, emails, or social media. Friends also can share lists of favorite spots or places they want to visit. The lists are available to view on Google Maps either on desktop, mobile or offline. While the feature brings a Foursquare-like feature to Maps, the ability to share the content cements the link between the user and friends. The network of advertising options that string together local ads and Maps with services like business listings in search engine query results have become part of Google's closed ad-targeting network. The company has been working to create a walled garden by using proprietary data to finely target individuals with ads and content without the need to share the data with brands or their agency partners. Google owns about 90% of the travel advertising market -- which equates to about $12 billion in revenue last year, with major online agencies such as Priceline and Expedia accounting for roughly half, according to RBC Capital Markets. The numbers, published Sunday in a research note, came from a RBC conference call with Skift, which provides analysis and insights on key sectors of travel. In the published research note, RBC Analyst Mark Mahaney wrote that 60% of the 230 travel industry participants in a propriety Skift survey "do not consider themselves to be a mobile-first organization and nearly half of travel providers are receiving 20% or less of their traffic from mobile." Mahaney said the survey numbers are one reason that companies like Priceline and Expedia, which have migrated to a mobile-first strategy, continue to gain share -- and Google too. While Google's favorite location feature in Maps may not require a plane flight, it could require travel by car. In January, Uber announced an integration with Google that allows travelers to hail a ride through Google Maps. It also offers the ability to see the driver in route, contact the drive, and follow the status of the trip without switching over the Uber app.